California’s one of the most famous national parks,Yosemite, is acres of an eye popping beauty. This majestic place moves hearts of people and causes every visitor to immerse themselves in a beauty that is tremendously lavishing. Yosemite is certainly famous for its gorgeous waterfalls but one can definitely meander into deep valleys , unraveled wilderness idealistic meadows, and view groves of grand sequoias. What can you do in Yosemite? Do you love adventure? Are you one of those individuals who have conquered fear of heights or are wanting to get rid of their acrophobia ? Then rock climbing should definitely be included on your list of “things to do”. Yosemite is world famous when it comes to rock climbing.Tourists from all over the world come here to experience the immense joy of rock climbing. These are few of the numerous hiking points but you should definitely check out other hiking spots as well. Any bikers out there? Do not miss the bicycle adventures in Yosemite. Over 12 miles of paved paths are available for bikers and also, you can rent bikes. As you bike through the trails you will get an opportunity to enjoy the scenery. You could also park your bike in the designated areas and swim in the nearest lake or have a picnic. Yosemite is a shrine to landscape photographers.If you are interested, photowalks are offered for free, all year long. Yosemite also offers photography seminars, make sure to check those out. Other than indoor pools in the lodges you are staying in, you can swim in the water bodies in the park. Merced River is a popular one but there are several locations where swimming is prohibited restrictly. Most of the visitors definitely try rafting and kayaking. If you are looking for some fun filled adventure than rafting is highly recommended. You can rent or bring your own raft equipments and raft on Merced River. If you wish to enjoy the calm waters than you can certainly kayak in Tenaya Lake. The hikes in Glacier point are mainly classified as strenuous, if you are an advanced hiker than glacier point is definitely your place to go. This is a 11 mile strenuous hike. Along the way you will be able to view domes within the Yosemite Valley and finally the beautiful Ostrander Lake. Though classified as strenuous, this hike is a rewarding one, once you reach the endpoint you can enjoy magnificent views of Clark Range, and Half Dome. Half Dome is an incredible challenge to all type of advanced hikers. In the way you will be able to view the gorgeous Nevada and Vernal Falls, furthermore, you will also be able to relish the breathtaking panoramic views of Yosemite Valley and High Sierra. This is an easy hike but not recommended during winters because the paths tend to get icy and somewhat slippery. This path will reward you with stunning views of Upper Yosemite Falls. This is another easy hike but during winter time the paths may become icy and slippery. Mirror Lake hike is also classified as easy but however, the paths do get icy during winter and slippery. This lake is extraordinarily beautiful because of the reflections created by the surrounding cliffs. Once you are at Yosemite National Park, you must not miss the beauty that this place beholds. All routes in Yosemite are worth sightseeing but the one road that is famous among all is the Tioga Road. We highly suggest that you stop on these treasure like spots and enjoy the scenes. This place is a grove of giant sequoias and are considered the largest living things in the planet. 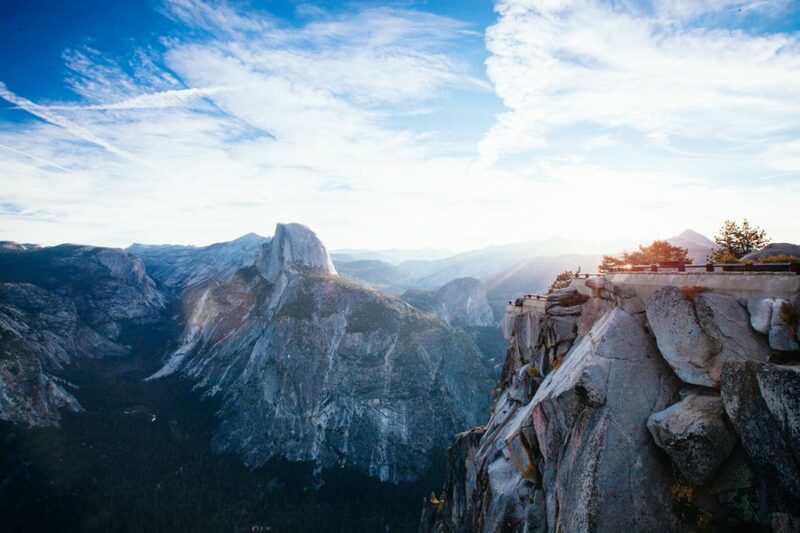 Glacier point allows you access to the views of entire Yosemite Valley, you can watch the sunset and this is also an excellent spot for stargazing. You can hike here and come across beautiful scenic places such as Rancheria Falls and Vernal Falls. Tuolumne meadows is known for its high elevation. The Tuolumne river is marked as the most scenic river. The water that flows in this river is so pure and clean that it requires minimal or no treatment at all. Water that are filtered through the meadow is provided for drinking in San Jose and San Francisco area.